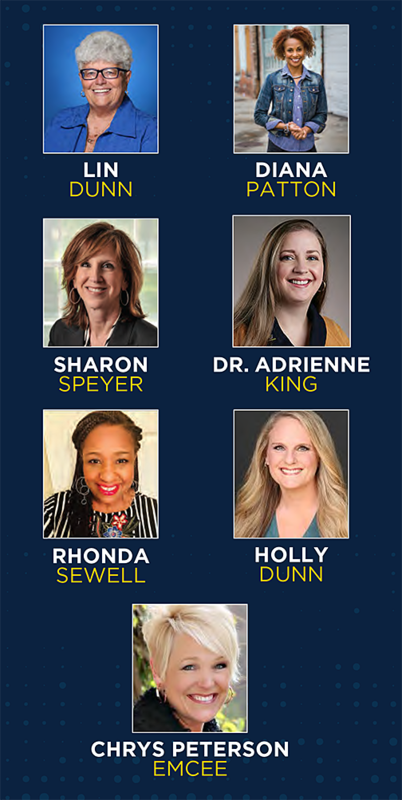 The University of Toledo women’s basketball program will host its second annual Lessons in LeadHERship Conference Tuesday, April 30. The event will take place from 8 a.m. to 4 p.m. in the Thompson Student Union Auditorium. The conference is designed to help grow female leadership in the Toledo community and is being sponsored by Rocket alumna Kelly Savage from Savage & Associates. • Holly Dunn, survivor and advocate. The only known survivor of the Railroad Serial Killer co-founded Holly’s House, a child and adult advocacy center for victims of intimate crimes. • Lin Dunn, who was inducted in the Women’s Basketball Hall of Fame in 2014. She has 40 years of women’s collegiate basketball coaching experience and coached for 11 seasons in the WNBA. • Dr. Adrienne King, UToledo associate vice president of marketing and communications. The 2018 Leadership American Program graduate joined UToledo in January from Murray State University. Under King’s leadership Murray State grew private support by an average of 47 percent and tripled the size of the school’s alumni association. • Diana Patton, UToledo law alumna and author of “Inspiration in My Shoes,” a 2016 memoir that chronicles overcoming abuse, racism and heartache. The CEO of Diana R. Patton Consulting LLC is an attorney who speaks about leadership, emotional intelligence, diversity, inclusion and equity. She serves on the UToledo College of Health and Human Services’ board and the UToledo paralegal advisory board. • Rhonda Sewell, manager of external and governmental affairs for the Toledo Lucas County Public Library. She was a journalist with The Blade for 18 years. Sewell is a member of the Toledo Press Club and is on the ProMedica Toledo Children’s Hospital Foundation board of directors. • Sharon Speyer, president of the northwest Ohio region of Huntington National Bank, a subsidiary of Huntington Bancshares, a $100 billion regional bank holding company headquartered in Columbus, Ohio. The UToledo law alumna is a member of the University Board of Trustees. Chrys Peterson, former WTOL news anchor, will serve as the emcee. The cost to attend is $50 per individual and $25 for high school and college students. For more information, contact Lauren Flaum, director of women’s basketball operations, at 419.530.2363 or lauren.flaum2@utoledo.edu. 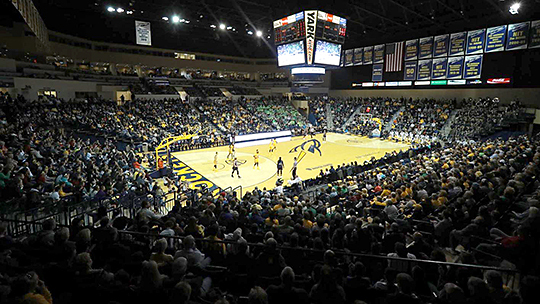 The NCAA released its final home attendance figures for the 2018-19 season April 8 and the Toledo women’s basketball team finished No. 30 in the country, averaging 3,728 fans per contest. The Rockets also led the Mid-American Conference in attendance for an unprecedented 29th consecutive season. Toledo led the Mid-American Conference in attendance an unprecedented 29th consecutive season in 2018-19 and ranked No. 30 in the NCAA, averaging 3,728 fans per home game. Toledo drew at least 4,000 fans to seven of its 17 home contests during the year; this includes a season best 6,059 against 2019 NCAA Championship finalist Notre Dame Dec. 8, the third-largest crowd in school history. The Rockets have ranked in the top 30 nationally in home attendance in seven of the last eight years under Head Coach Tricia Cullop. The Midnight Blue and Gold also finished No. 28 (3,748) in 2011-12, No. 25 (4,012) in 2012-13, No. 24 (3,932) in 2013-14, No. 28 (3,636) in 2014-15, No. 24 (4,050) in 2015-16, No. 27 (3,744) in 2016-17 and No. 31 (3,420) in 2017-18. In 11 years under Cullop, the Rockets are 137-40 (.774) on their home court, including 77-22 (.778) against conference opponents. Toledo also has won at least 11 home contests in nine seasons under Cullop, including a school-record 19 victories during the 2010-11 campaign. 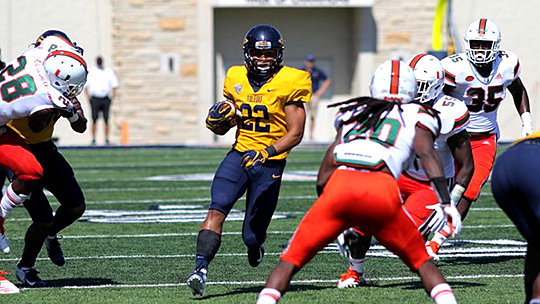 The Toledo Rockets will hold their annual Blue and Gold Spring Football Scrimmage at the Glass Bowl Friday, April 12. Kickoff is set for 7 p.m. Admission is free. The scrimmage will use a running clock and is expected to last about one hour. Player autographs will be available for fans immediately following the game in the west stadium concourse. scrimmage Friday, April 12, at 7 p.m. in the Glass Bowl. Fans may enter the Glass Bowl via Gate A, located on the west side of the stadium near the press tower. Fans can park in lots 9 or 10. Earlier in the day, from 11 a.m. to 2 p.m., the Rockets will host Food Court Fridays on campus in lot 6 adjacent to the UT Outdoor Track. Food trucks from Deet’s BBQ and Rosie’s Rolling Chef will be on campus for Rocket fans to purchase lunch. Fans also will have the opportunity to renew or purchase their 2019 football season tickets and receive a free Toledo Rockets flag. There will be fun activities such as corn hole, giant Jenga, a football toss contest, music and photo opportunities with the Toledo mascots. A raffle will be held with prizes, including football tickets, pre-game field passes, a signed football and a Coach Jason Candle bobblehead. The deadline to renew or buy 2019 Toledo football season tickets and receive a free Toledo Rockets flag has been extended to Friday, April 12, before the start of the spring scrimmage. Call 419.530.GOLD or visit the Toledo Rockets’ website to get your tickets and flag today. Head Coach Jason Candle’s 2019 squad returns 51 letter winners and 14 starters from last season’s team, including sophomore running back Bryant Koback, who led the Rockets with 917 yards rushing as a freshman. The Rockets were 7-6 in 2018, and are one of only nine schools in the Football Bowl Subdivision that have had a winning record in each of the past nine seasons. In the event of inclement weather, the spring scrimmage and Food Court Friday will be canceled. Check Twitter (@ToledoRockets), Facebook (UTRockets) and the Athletics’ website for any cancellation notices. University of Toledo Vice President and Director of Athletics Mike O’Brien had a courtside seat for the NCAA Men’s Basketball Tournament South Regional in Louisville, Ky.
University of Toledo Vice President and Director of Athletics Mike O’Brien, center left holding microphone, talked to University of Virginia Men’s Basketball Coach Tony Bennett after the Cavaliers beat the Purdue Boilermakers to win the NCAA Men’s Basketball Tournament South Regional and advance to the Final Four. He is a member of the National Collegiate Athletic Association Division I Men’s Basketball Committee. 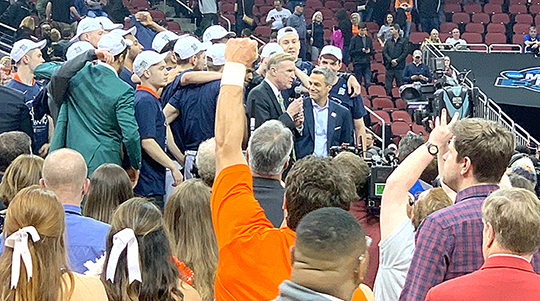 Following Virginia’s thrilling 80-75 overtime victory over Purdue March 30, O’Brien presented a Final Four trophy to the Cavaliers, who won the South Regional of the NCAA Men’s Basketball Tournament and advanced to the Final Four. Last year, O’Brien was named to the 10-member committee that selects, seeds and brackets the field for the NCAA Tournament. 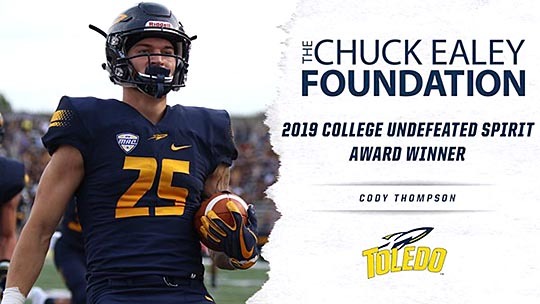 University of Toledo senior wide receiver Cody Thompson has been named the 2019 recipient of the Chuck Ealey College Undefeated Spirit Award. Thompson is the 12th Rocket who will receive the prestigious award at the annual Songfest event in Savage Arena Saturday, March 30. He also will be honored at the eighth annual High School Undefeated Spirit Award Ceremony Sunday, March 31, at the ProMedica Steam Plant. During his career, Thompson was a two-time, first-team All-Mid-American Conference wide receiver for the Rockets. He caught 181 passes for 3,312 yards and a school-record 30 touchdowns. As a senior in 2018, he had 48 receptions for 647 yards and 10 TDs, and was named second-team Academic All-America. In 2017, Thompson suffered a season-ending injury in what would have been his final campaign with the Rockets. However, because of his injury, he was eligible to play an additional season of college football. After an off-season of rehab, he returned to lead the Rockets in 2018. He graduated with a bachelor’s degree in marketing in December 2017 and is pursuing a master’s degree in recreation and leisure. Founded in 2007, the Chuck Ealey Foundation presents the award to the student-athlete who best demonstrates the behaviors of living the undefeated spirit in his or her sport, in the classroom and in the community. Award winners are role models for making good choices and living with an undefeated spirit in everything that they do. The award also recognizes that behind every person with an undefeated spirit, there are others around them who have instilled this spirit. It is named for Ealey, who was one of the greatest football players in Toledo history. A quarterback, Ealey led the Rockets to a perfect 35-0 record and three Mid-American Conference Championships from 1969 to 1971. His mother, Earline Ealey, is the inspiration behind the award. She lived her life with an undefeated spirit and instilled that spirit in her son. Chuck Ealey has been working to instill the same spirit in his family and everyone around him. The foundation uses undefeated as an acronym, standing for undefeated, no negativity, determination/desire, encouragement/endurance, faith/focus/fortitude, equality, attitude/actions, tenacity, education and discipline. The Undefeated Spirit Award has been presented annually at the University’s Songfest as a way to bring together student leaders and student-athletes. Senior Jaelan Sanford has earned additional postseason honors, receiving First-Team All-District 14 recognition from the National Basketball Coaches Association. Sanford’s honor marks the eighth straight year at least one Rocket has been included on the all-district squad. The National Basketball Coaches Association divides the nation into 25 districts and honors 10 players from each district, signifying a five-player first team and a five-player second team. A 6-foot-4, 200-pound guard, Sanford earned first-team All-Mid-American Conference honors this season after being a second-team All-MAC selection a year ago. Sanford paced the Rockets in scoring with 15.5 points per game and ranked second with 3.2 assists per game, a 1.7 assist/turnover ratio, 75 free throws made and 89 free throws attempted. He also ranked first in the MAC with an 84.3 free-throw percentage and topped the Rockets with 26 double-digit scoring contests. He finished his career in fifth place on Toledo’s all-time scoring list with 1,789 points and fourth with 238 three-point field goals. He also started a school-record 133 straight games and tied Jordan Lauf and Nate Navigato for most games played in a career. Big Ten member Northwestern utilized a 25-2 second-half run en route to claiming a 54-47 victory over Toledo Sunday in the second round of the Postseason WNIT in Savage Arena. With the loss, the Rockets end their season with a 21-12 record. Senior Kaayla McIntyre had 12 points and 10 rebounds vs. Northwestern March 24 in the second round of the Postseason WNIT. The Wildcats (18-14) shot 40.0 percent (10 of 25) from the field and 77.8 percent (14 of 18) from the free-throw line after the intermission to erase a nine-point halftime deficit, while UT went 14-plus minutes without a field goal. The Rockets made only six baskets in the second half and scored 18 points after the break, compared to 10 field goals and 34 points for Northwestern. 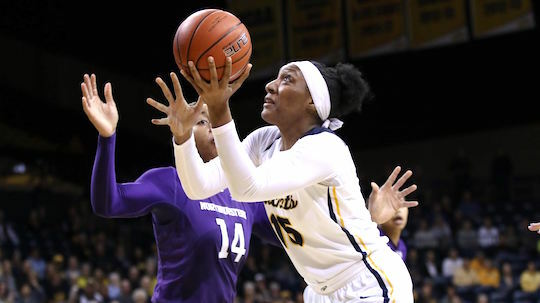 Senior Kaayla McIntyre paced Toledo with 12 points, nine boards and three thefts, while classmate Mikaela Boyd had 10 points. The Rockets also received seven points from sophomore Nakiah Black, six from junior Sara Rokkanen, and a game-high seven assists by junior Mariella Santucci. As a team, UT shot 36.0 percent (18 of 50) from the field, including 23.1 percent (4 of 17) from three-point range and 58.3 percent (7 of 12 from the charity stripe. Lindsey Pulliam led Northwestern with a game-high 17 points, followed by Veronica Burton and Abbie Wolf with 13 and 11, respectively. Burton and Wolf spearheaded the visitors second-half effort, tallying 10 and nine points after the intermission to help NU advance to the Sweet 16 in the 22nd annual postseason tourney. With the completion of today’s game, the collegiate careers of seniors Boyd, McIntyre, Sarah St-Fort and Mae Tshitenge came to an end. The Rockets’ quartet were a part of 81 overall victories over the last four seasons, including 43 league wins. They also played a significant role in helping the Midnight Blue and Gold secure three post-season berths during this time, including a 2017 Mid-American Conference Championship. Nominations for the 2019 class of the Varsity ‘T’ Hall of Fame are being accepted through Monday, April 15. Nominations may come from any source. Nominations from previous years automatically carry over to the next year. • Any athlete who has performed with distinction at The University of Toledo. The athlete need not necessarily be a graduate. • Any athlete who has been out of the University for at least five years and who has demonstrated good citizenship since leaving the University. For the 2019 class, nominees must not have been active on or after July 1, 2014. • Any coach, administrator, trainer, etc. who has served The University of Toledo with distinction for a period of at least five years and who has been retired or resigned or otherwise disenfranchised from his/her position for a period of at least five years. For the 2019 class, nominees must not have been active on or after July 1, 2014. The nomination form can be found on the Toledo Rockets’ website. Email the nomination form along with all supporting data to Paul Helgren at paul.helgren@utoledo.edu. Members will be chosen by a three-quarters vote of the selection committee. The Varsity ‘T’ Hall of Fame banquet will be held in the fall, with the 2019 class being presented at halftime of a Toledo football game. 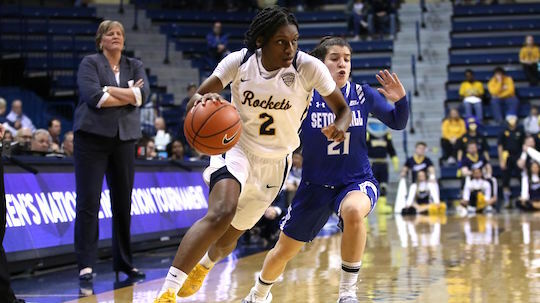 Toledo pounded out a hard-fought 71-65 victory over Big East member Seton Hall Thursday night in the first round of the 2019 Postseason WNIT in Savage Arena. 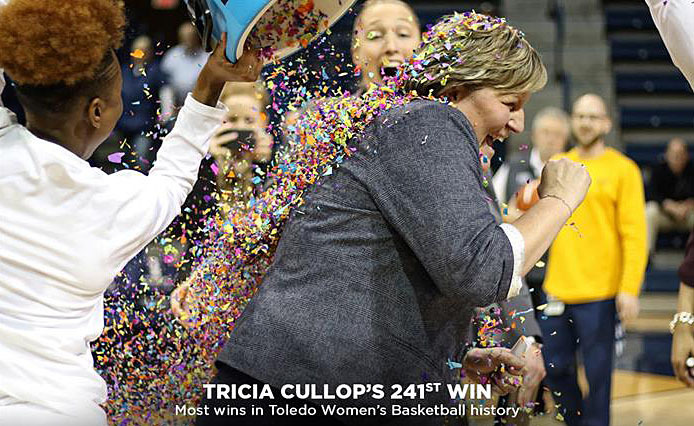 With the win, Head Coach Tricia Cullop became the school’s all-time winningest women’s basketball coach passing Mark Ehlen (240-149, 1995-2008) with 241 victories patroling the Toledo sidelines. Senior Mikaela Boyd had 15 points and five boards vs. Seton Hall in Toledo’s first-round victory in the Postseason WNIT Thursday night. The Rockets (21-11) advance to the second round for a matchup vs. Big Ten member Northwestern (17-14) Sunday, March 24, at 2 p.m. in Savage Arena. For ticket information, go to the Toledo Rockets’ website. Senior Kaayla McIntyre paced four Rockets in double figures with 16 points, followed by senior Mikaela Boyd and sophomore Nakiah Black with 15 and 14, respectively. Junior Sara Rokkanen rounded out Toledo’s double-digit scorers with 10 points off the bench. Toledo also benefited from seven points and a game-high seven assists from junior Mariella Santucci to win its first-round game in the Postseason WNIT for the seventh-straight time. As a team, the Rockets shot a respectable 47.5 percent (28 of 59) from the field, including 30.0 percent (6 of 20) from three-point range, and 75.0 percent (9 of 12) from the charity stripe. UT also held a 32-28 edge on the glass and finished with 21 assists on 28 field goals, marking the eighth time it has posted at least 20 helpers. Selena Philoxy led the Pirates (15-16) with a game-high 19 points, while Nicole Jimenez and Victoria Cardaci had 15 and 14, respectively. Seton Hall was without the services of its leading scorer Shadeen Samuel, who did not dress for the game due to illness. The 2018-19 first-team All-Big East honoree came into the post-season game averaging 18.3 points per game, 8.6 rebounds per game, 2.6 assists per game, 0.8 blocks per game, and 1.5 steals per game and 32.3 minutes per game. 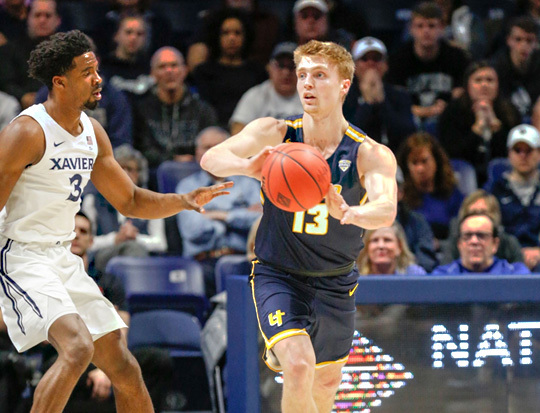 A shorthanded Toledo men’s basketball team saw its successful season come to a close Wednesday evening with a 78-64 loss at Xavier in the first round of the 2019 National Invitation Tournament at the Cintas Center in Cincinnati. The Rockets concluded the season with a 25-8 record, the second most victories in school history. Senior Jaelan Sanford led Toledo with 23 points in its 78-64 loss at Xavier. The Musketeers will play at Texas in the second round Sunday, March 24. 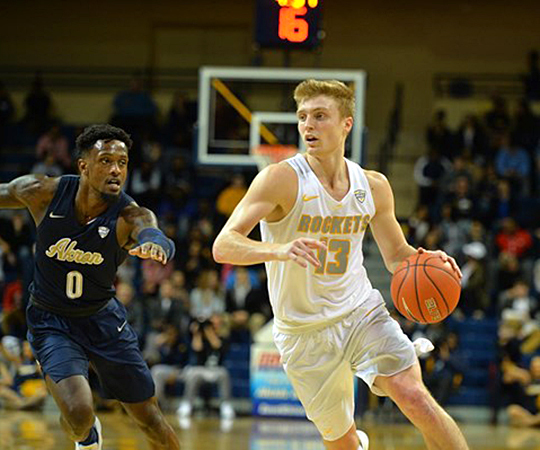 Senior Jaelan Sanford scored a game-high 23 points to lead the Rockets, who were playing without a pair of injured starters — junior Willie Jackson and sophomore Marreon Jackson. Senior Chris Darrington registered 18 points, a career-high five rebounds and four assists. Also scoring in double digits was senior Nate Navigato with 16 points on 4 of 7 shooting behind the arc. Sophomore Naji Marshall topped Xavier with 20 points, a career-high 21 rebounds, and a team-high six assists. Marshall’s work on the boards helped the Musketeers control the glass by a 51-31 margin. The Rockets shot 39.0 percent from the field and limited the hosts to a 40.3 shooting mark. Toledo led by as many as four points in the first half before settling for a 27-27 tie at intermission. Darrington’s layup with 16:04 remaining put the Rockets in front 36-35, marking the last time UT led in the contest. Xavier responded with a 23-2 spurt over the next five and a half minutes to take control.